No matter how much you deny it, religion and brands do have a lot in common. In fact, most of the terms are interrelated. Not only do they target a specific group of masses, but they also have their own sacred emblems and landmarks that constitute their true identity. Don’t get me wrong, but take a closer look at how a religion operates. Oh no, they don’t use the force of their clairvoyant preachers and leaders to spread their intended messages, they marinate the religious dogmas in relative emotions to unearth that religious zeal in their audience’s minds. As the audience imbibes and exchanges these religious dogmas, there comes a point when they become emotionally attached to the idea. The more a person becomes bonded with the unique perspective, he becomes a motivated advocate of it in his respective community and then what we get is an influencer who lures in other community members to share and propagate his notion. Now that you understand how a religion gets branded, replace religion with any brand in the aforementioned scenario. Fits like a glove, doesn’t it? If that falls short to convince you, let’s consider another fact. You probably use social media and you’re connected with your relative local church; you could view what your church is up to and how they’re propagating their preaching. Not to mention that they could use various social media tactics to enhance their church’s presence. And with that in mind, again, replace your church with a brand you prefer. It’s all becoming clear, eh? Both of the cases present the same ideas religion and brands are taking on. And by the way, it isn’t just Christianity that’s been soaking up the essence of branding, most brands also use religion as a stimulus to trigger an emotional response from their targeted audience. Moving onwards, we’ve seen how intertwined religion and brands are, which is why we’ll now discuss how brands and religions connect on that very level of sameness. So, even if religion and brands didn’t have anything in common, they’d still intersect at one point aka the audience. Both need an audience to thrive and grow. The digital media has enabled us to blur the lines of distinction and make the religion and branding relative to each other. Both are now using logos to intensify their strategies to cope up and meet the requirements of their audience. 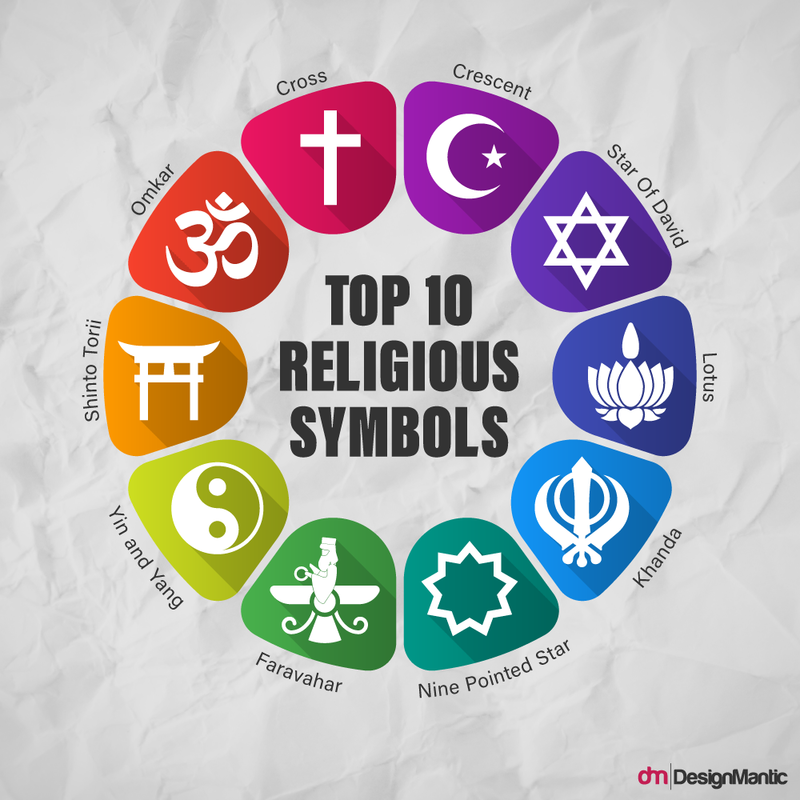 If we talk about religious branding from a religion’s perspective, we may come across familiar religious logos that have been around since the historical inception of a religion. Ever wondered why brands get proactive during religious holidays, offering discounts and exclusive products? You know what I’m talking about, don’t you? If you aren’t able to grasp the idea, here’s a hint. Think scented candles guaranteed to make your home smell like a church or maybe even that cross-shaped sterling silver pendant you bought during the Christmas sale. Brands manipulate the audience in order to evangelize their products coated in religious themes. And in this case, your brand loyalty comes after your loyalty to the religion. Thus, we come across the point where we are made to relate our religious senses to those implicated by the brand. We are intrigued to connect with the religion and brand in an affectionate manner. How a brand portrays a religion tells a lot about how deep its roots are within the religious grounds. When it sells using a religious logo or symbol, it indirectly emphasizes the depth of the personal bond a person has with their religion. It’s the religious logo that sells. No big deal about that. But you probably didn’t know that the marketing threshold increases multiple folds using the name of the religion alone. As for the religion using brands for propagation, it could be achieved via brands sponsoring religious activities and charities within the local religious community or enhancing their digital media presence. In most cases, it’s a win-win for both! The best bit here is that even if the product is the one with a nominal significance, the way the religion’s logo is represented by the brand becomes a memorable feature. I don’t mean to be blasphemous, but would you like to try some religio-brand cocktail? It’s fresh from the market and guarantees to energize your religious senses. Let us know if you want some in the comments below!